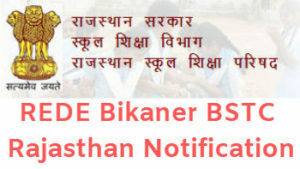 The Registrar Education Departmental Examinations (REDE), Bikaner has announced the notification for BSTC General/ BSTC Sanskrit Entrance Examination 2019 for admission into Basic School Training Course. 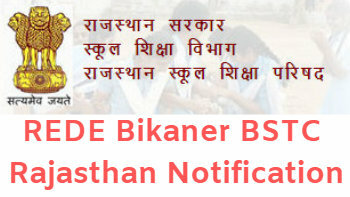 The Registrar Education Departmental Examinations, Bikaner are going to invite soon the application form. Those candidates who are eligible for this Exam can apply the online application from 14/03/2019 to 10/04/2019 through the website of Rajasthan. BSTC is going to held the BSTC Entrance Examination on 26/05/2019. Rajasthan BSTC 2019 is all set to organize the Entrance examination of BSTC Sanskrit/General (D.EL.ED) on 26th May 2019 for admission in Basic School Training Certificate 2019-20. Those candidates who are willing to get admission in Basic School Training Course can apply the application form at the website of BSTC Rajasthan from 14 March to 10 April 2019. All the candidates who found eligible for BSTC Exam may assign for this Entrance Test. Rajasthan BSTC examination 2019 will be conducted on 26th May 2019 at the School Education Department Level in replace of Higher Education Department. 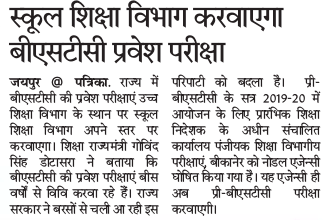 The admission test of BSTC in the state was being done by the universities for nearly 20 years, now it has been given the education department’s departmental education department for Bikaner. This will strengthen the education department’s financial strength, with the department having another important Will be responsible. For Further Details about the BSTC Test 2019 like Eligibility Criteria, Admission Process, Age Limit, counseling or more. So candidates are advised to must read this article given below. First applicants go to the official website Portal of Registrar Education Departmental Examinations, Bikaner. And now upload all the relevant documents. For BSTC General: Candidates should have Passed Class 12th to any recognized university or institution. For BSTC Sanskrit: Candidates should have Certificate of Class 12th with Sanskrit subject. Candidates should have a maximum age of 28 years. Age relaxation in upper age limit shall be prescribed for reserved category. Admission in Basic School Teacher Course will be based on performance in BSTC ( D.EL.ED) Entrance Exam and those candidates qualify for Entrance Exam are selected on the basis of merit list prepared. Final selection will be based on counselling. For BSTC (General) – All Candidates have to pay RS 26 Application Fees + RS 400 Examination fees. For BSTC (Sanskrit) – All Candidates have to pay RS 26 Application Fees + RS 450 Examination fees. Candidates will pay Application Fees though eMITRA Kiosk. The link provided given under. Those Candidates who successfully submit the Application form can get their BSTC Entrance Exam Admit Card 2019 through the website. Applicants can download their BSTC Exam Hall Ticket 2019 by entering their Roll Number, Date of Birth etc. After attending the BSTC Entrance Exam candidates are eagerly waiting for Results. BSTC Result 2019 is going to declare in June/July 2019. Applicants can check their result by entering their Application number, Date of Birth etc. Candidates can download the BSTC Result for future preference. Those Candidates who found their name in result List will be able to attend counselling Round. There will be 3 rounds of Counselling which will be conducted by Registrar Education Departmental Examinations, Bikaner. Candidates who successfully pass in BSTC course will be able to get BSTC certificates.